When you are touted with so many different descriptions for slot machines, it is often tough to get to the bottom of the terminology of some these given names or nicknames. A bonus slot machine pretty much covers most slots out as long as it has a bonus game or feature attached to it. What is a Bonus Slot? 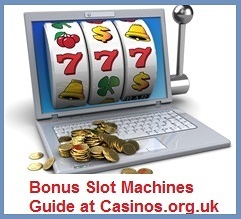 Nearly every video slot machine online is a bonus slot machine of some description. Even some ‘Classic Slots’ have bonus games added on to them. Bonus games can exist on classic slots, multi-payline slots, video slots and basically just about any slot in any category that has a bonus game. Therefore, bonus slots can be cross categorised with other categories such as classic and vide slots. A video slot is a virtual slot machine or a real life slot machine operated with a video machine. It then becomes a bonus slot when it come with a bonus round. Basically, in this case we are seeing an example of a lot that fits into both the bonus and video slot categories. They also come in a mixture of themes. In fact, you name it, and you can probably find it. Bonus games are usually based on the theme of the slot, so you can imagine the bonus rounds that come with slots named; Gold Rush, Batman, Amazon Jungle, Spiderman, Tomb Raider, Race for Riches as well as a limitless number of other slots. Any slot that does not come with at least some kind of bonus round feature is deemed not to be a bonus slot machine. So that means no ‘pick me’ features, no gamble feature, no free spins bonus round and no bonus games to play. Generally a classic slot is an example of the simplistic non-bonus slot machines of the past, which some still exist today. They don’t come with any of the above features, therefore, they offer a standard slot game that dates back to the days of how slots used to be played – hence the name ‘Classic Slot’. Arguably, the most attractive side to playing slots is the bonus games – well, at least for a large number of slot players it is. There are of course those that prefer straight out slots play, but beating the experience, interactivity, intensity, sounds and graphics involved with playing a bonus game slot is tough going, and so the majority of the most popular slots out there have a bonus game. Triggering a bonus game usually means linking up special bonus symbols or a bonus symbol on the reels. Sometimes the scatter symbol also launches bonus games, but nowadays the scatter is used more for triggering ‘free spins’; mentioned in section 2 below. Other ways to get into bonus rounds are collecting symbols. For instance, if you play the Aliens slot, there are multiple levels to get through, and the only way to move up a level is but collecting combination wins. Other games require you to collect a number of scatters on the reels and the counter will move up until full, which is when the bonus game begins. Having multi-level play usually means that a certain number of symbols need to be collected or milestones to reach the next level. One of the most highly rated multi-level bonus slots out there right now is Merlins Magic II. Bonus games come in a mixture of styles that it would be far too difficult to comprehensively cover every style of game here, but we will give you a few pointers. Also, bonus games are very interactive – most of the time they require the player to use some kind of skill to decide their fate. We all know and most of love arcade gaming. Some of the best arcade style bonus slot games are Shoot ‘em’ Ups, Driving Games, Strategy, Indiana Jones style missions and pretty much any game that suits the theme of the slot that you are playing. Sports games can include popular round of golf, football matches, horse racing betting, tennis matches, Olympics (modern and old) and other games that will test your sporting prowess. These are the easiest kind of bonus games to play. There is no skill involved in most games just luck, but it is still amazing at how easy or how much effort can be put into a simple pick me game. Some are very simple games where you are given a selection of items to pick and you can accumulate a number of prizes until you have them all or until you hit an item that ends your pick me game. Additionally, there are pick me games such as Midnight in Paris with graphics, animations and awesome sound effects. For instance, in the bonus game on Midnight in Paris you are the security guard. You and your trusty dog have to search around the art museum and choose spots where you think the thief might be hiding – at the same time you will find mini prizes and if you also find the thief, then you get a nice big juicy pay out. As we are in the world of real money gambling, themes that represent casinos, casino games, lottery, Keno or bingo game are always going to be popular. We all love some free goes on the reels, after all, it is free money from combos for nothing paid to a certain extent – well apart from the investment put into the spins that got you there! On most bonus slot machines today, you need to combine scatter symbols in exchange for free spins. The majority of slots will offer more spins for a higher number of scatter symbols. For example, 3, 4 or 5 scatter symbols will give you a return of 5, 10 or 15 free spins respectively. In addition, you can win more free spins through the retrigger. This is when you land the scatter combination that triggers free spins while playing the free spins round. Furthermore, multipliers that multiply you combination win, extra wilds and wild reels can all be added to help you have a better chance of landing a winning combo. Some free spins rounds are very special indeed because they use different reels to the main game. New symbols appear on the reels, lower paying symbols deleted from reels or additional scatters can be introduced for retriggers or multipliers. Gamble features are very popular for those that want to increase the value of their lower wins. There are some really interesting bonus games out there today, but on the whole the most popular use playing cards. In Game of Thrones, the bonus round uses a ‘Trail Map’. Each step across the map will give you, the player, higher prize awards. To successfully progress each step across Westeros and Ethos, you need to flip a coin and win the flip. Other gamble games based on the card system are also quite popular. You basically have 2 choices. Pick the correct suit of the card for quadruple your winnings. Or just pick the colour of the next card and if successful, you will win double your winnings. You can then choose to exit with your new amount of cash or you can stay and continue to gamble; usually up to a maximum of 10 times if you can get on such a good winning streak. Some bonus games appear totally at random. 243 Ways to Win Jurassic Park by Microgaming has an awesome T-rex Alert game that randomly triggers. In the massive millionaire making machine – Mega Moolah – the progressive jackpot bonus game will randomly trigger. There are 4 progressive jackpots to be won here. The wheel of fortune will spin, and if you hit the Mega Jackpot – boooooooooooom – you will be a millionaire! Years ago slot machines had no bonus rounds. It wasn’t until the well-known slot machine ‘Reel Em In’ was released on the market until we started to see bonus round introduced. In the past on the live slots, the bonus game was usually a piece of glass with the theme put on top and LEDs flashing to show player progress. Soon the internet would hit the World Wide Web, and this is when the sky was the limit for slots. Literally anything can be made in the virtual world and so the bonus round became a super arcade or PlayStation style feature on bonus slots. Bonus slots can be found in multiple categories such as Classic Slots, Multi Payline slots, Video slots and more as long as that slot has a bonus game attached to it. Playing bonuses on slot machines has also become incredibly popular. The games can match the graphical intensity of any PC game if the slot designer released a high end machine. We are also now beginning to see the cinematic slot machines out there too – such as Batman: The Dark Knight Rises progressive slot and Terminator 2 non-progressive slot – whereby the reels and bonuses actually come up with movie clips straight from the movie. All this is accompanies with sound effects from characters in the movie and a play by play as well as scene-by-scene re-enactment of the movie right on the reels!